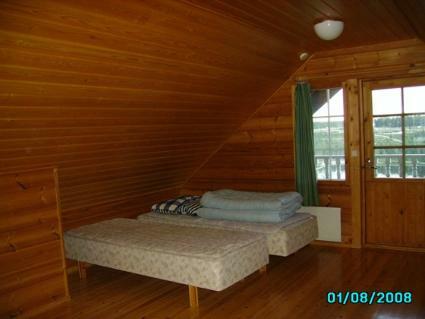 The upstairs of a semi-detached house located in the Ukkohalla tourism centre, 75m2, built in 1990. 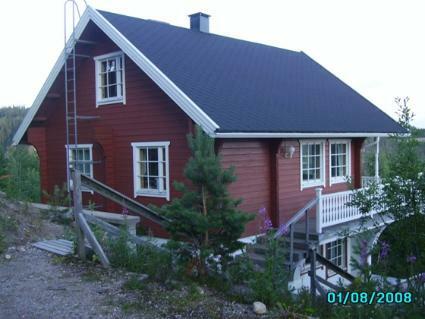 Kitchen, 2 sleeping corner, loft, sauna, shower room/toilet, balcony, fireplace. 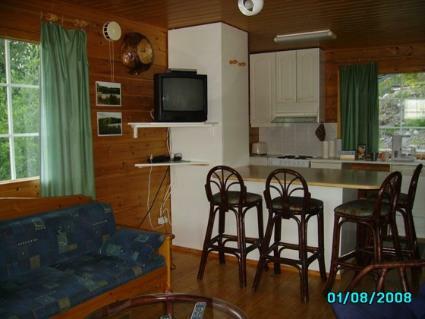 Bunk beds in the sleeping corner, 120cm double bed in the other sleeping corner, 2 beds and 2 beds on the loft, a an opening bed in the living room. Ukkohalla: Tourism centre located by Lake Syväjärvi, with an information centre, store, restaurant, spa, slope centre, snowmobile tracks, ski tracks, programme services, beach (further information at www.ukkohalla.fi). Distance to the Ukkohalla services 1.5 km. Kajaani airport 86 km, Oulu 170 km, Helsinki 650 km, bus stop Hyrynsalmi 18 km, railway station Kontiomäki 66 km. Pets allowed. Beautiful view over the slopes and Lake Syväjärvi. Cottage is available at 4.00pm on arriving day - till 12.00 on departure day. Rating given by customers 3.0. Based on 3 reviews. Mökki kivalla paikalla, hienot maisemat rinteeseen! Mökki oli mukava ja tilava.